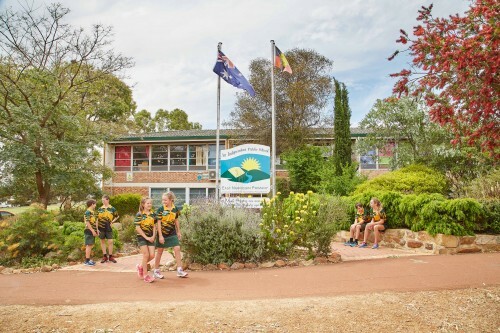 At East Narrogin we provide a welcoming, caring and stimulating learning environment for our students, actively ensuring children are taught the essential knowledge, skills, understandings and values of the Western Australian Curriculum Framework to fit them well for their future. From 2013, thanks to the support of our School Board, East Narrogin will be an Independent Public School. This acknowledges both our school community’s trust and faith in our school as well as the Department of Education’s recognition that we have the expertise and capacity to take up this challenge. School priorities in Literacy, Numeracy, Pastoral Care and Developing Community are supported by an experienced and dedicated team of teachers, education assistants, Aboriginal Education Officers, our school chaplain and school support staff. We provide specialist teachers in literacy, numeracy, library, physical education and the arts, to enhance our curriculum delivery. Our student leadership program involves all Year 6 students through training and opportunities to develop their leadership skills. Our Pastoral Care approach provides a safe, accepting school environment for all students, supported by special programs and a consistent approach to managing student behaviour. The success of our whole school approaches in addressing the particular learning needs of our students have resulted in a National Literacy Award in 2007 and being awarded Literacy School of the Year at the Western Australian Education Awards in 2010. Our literacy stairway approach ensures children acquire the essential skills for literacy steadily over their schooling, through systematic and targeted teaching. We are fortunate to have strong community support for school programs from our School Board, P&C, Rotary, with our CCALS intervention program, the Fremantle Literature Centre, our School Volunteer Program mentors, and our parents and caregivers in supporting our Home Reading program. In 2011 our school was one of only 16 schools across Western Australia to receive an award for achieving our Bronze targets for our health plan which provides explicit teaching of resiliency skills so students can make good choices in relation to Protective Behaviours, Sun Protection, Road Safety and Drug Education. Our health plan is supported by such programs as SDERA (School Drug Education and Road Aware), Crunch ‘n’ Sip, SunSmart and a healthy canteen. Each year we provide a community forum to share our students’ learning in health and resiliency to our school community. More information about the school’s operations can be found in our school information booklet.